The menhir of Kermorvan and the comet grave of Mougau-Bihan were built on exactly the same latitude line in Brittany, France. The menhir of Kermorvan at Le Conquet, on the western tip of the peninsula, has a rare petroglyph of the giant Comet, which caused the Catastrophe of c.2345 BC. It shows that the planet Earth passed through the tail of this Comet (or Comet Swarm) during two months, and that the whole Catastrophe lasted for four months. A precipitation of about seven meters of water during these days caused terrible floodings, in which about half of the people died. It happened at the start of the Sixth Dynasty of Egypt (c.2370-2189 BC), which leaded to the end of the Old Kingdom. 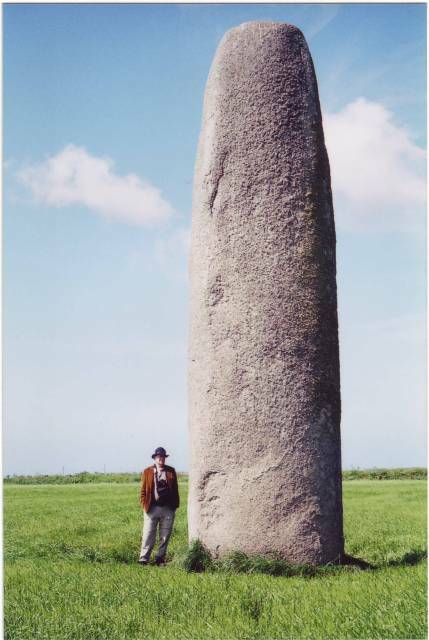 Originally, this menhir (Fig.1) was situated at the coast near Le Conquet, at the westernmost tip of Brittany. This is at a distance of 60km due west of the comet grave of Mougau-Bihan, discussed in a previous article.25 The site provides a splendid view over the Ocean. At the start of the twentieth century the Stone was found here on the narrow Kermorvan peninsula, "projecting from the side of a small elliptical mound" In the center of this mound "a rectangular cavity lined with dry-stone walling" was excavated. "Apparently" it was "a Bronze Age type burial mound, but no burials or grave goods were found"6 Now, the menhir is exposed to the public in the Prehistoric Museum of Penmarch, at St. Guenole 70km SE of the site (Fig.1). 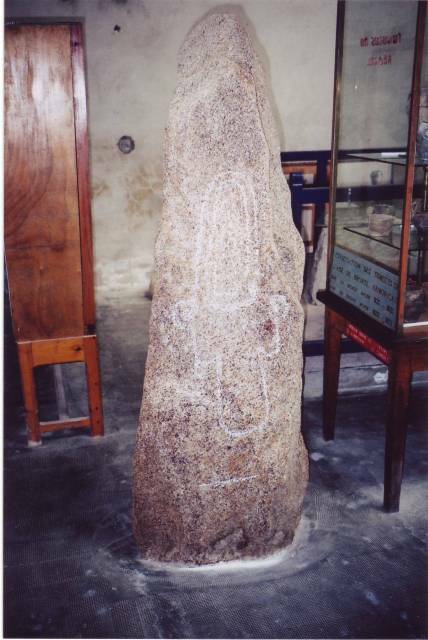 The granite menhir (standing stone) has a height of 180cm, and width of 55cm (Fig.2). The upper part was steeply bevelled, and subsequently smoothened, over a large surface area. Its flat front side bears a unique petroglyph, widely considered as a true enigma. Most archaeologists believe it is a rare type of "dagger"6 However, we are convinced it is the image of a hugh Comet, because it resembles the comet glyphs of Mougau-Bihan and other, related monuments. At the top the head or coma is shown. This part of the Stone was carefully picked and dressed (see Fig.2). Below it, the wide section of the tail was engraved. Further below, it was narrowed down, because this part of the tail was thin and transparant. The whole Stone has the shape of the glyph, and the smoothened top of it resembles the front side of the Comet. It supports the astronomic interpretation of the petroglyph. Until now, almost all megalithic petroglyphs had geographic meanings.1-5 This particular petroglyph has besides an astronomic meaning (see above), also a geographic meaning (Fig.3). The whole figure also represents the North Atlantic Ocean. At the top is an accurate coast map of the whole island of Greenland (dressed). Before the discovery of America, from 3300 to 2500 BC, it was the westernmost area of the then known world. The SE Coast of Greenland is clearly shown, with Cape Brewster in the east, and Cape Farvel in the south. Below the dressed part of the glyph is a curved line, representing the sailing route around South Greenland.1-5 It starts at Iceland (the dot), proceeds around Cape Farvel, and finishes at the West Coast of Greenland, near the shortest crossing to Baffin Island, at 66o N. The crossing to America has not been engraved, because that is not what the petroglyph is about. The little round in the east represents Brittany, where the menhir of Kermorvan is situated. The little round in the west is the island of Newfoundland, at the same latitude. Here, the East Cape of North America is located .1-5 Below the whole inscription the horizontal line is shown, again. The natural reliefs at both sides represent the shores of Europe and North America, respectively. The horizontal carving is the latitude line of Brittany and Newfoundland, at 48o N. It is at the level of Le Conquet, Brittany, where the menhir of Kermorvan is located. The two circles of the Comet glyph also represent two Moons (Fig.2). So, these have double meanings. Each Moon symbolizes a time period of a month, or 30 days. However, both Moons have a dot inside. So, each of them represent a double month, or 60 days. The south point of Greenland, at 60O N, confirms this meaning. 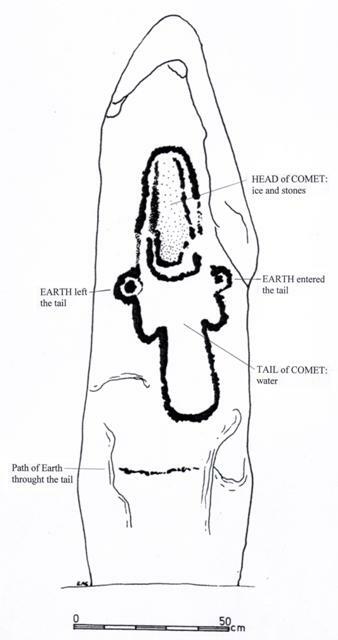 The encircled dot at the right side indicates the Earth passed through the tail of this Comet during two months (60 days). The southern course of the sailing route from Iceland, with its many volcanos, suggests hugh forest-fires because of falling rocks. The rest of the sailing route suggests torrential rains and tremendous floodings everywhere. It was completely dark on Earth. The encircled dot at the left side indicates the two months after it, when the planet Earth tried to recover. This time period is symbolized by the unusual sailing route around the North of Greenland, back to its East Coast (the deep carving around the top of the glyph). Heavy showers, snow and hail storms continued, and it was bitterly cold, because the whole climate was disrupted.11-22 It was a Worldwide Catastrophe. The complementary latitude of the south point of Greenland refers to the Nile Delta, at 90o - 60o = 30o N. People hoped that the Egyptian Sun God Ra would save their lifes. The comet grave of Mougau-Bihan, with the greatest collection of comet glyphs in Brittany, appears to be the most important monument of the big Comet Catastrophe of c.2345 BC. Both the menhir of Kermorvan and this grave are situated on the exact latitude line of 48.4�N. It encodes a world population of 4.84 million men before the Disaster. This latitude line also plays an important role in the petroglyph of Kermorvan (see above). It appears to be symbolic for the number of victims. The relative latitude amounts to (48.4/90)x100= 53.8, suggesting a mortality of 54%. So, more than half of the people died: 2.60 million men. The two circles at both sides of the Kermorvan glyph appear to support it. The circle at the left side symbolizes the Realm of the Dead. The carving is deeper, and slightly bigger than the circle at the right side, confirming that more than half of the people perished. In addition, most of the survivors were seriously injured. 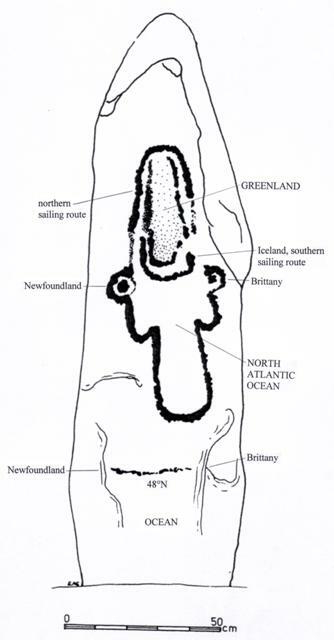 The comet petroglyph of Kermorvan consists of six separate carvings, which can be best described using the geographic interpretation (fig.3): the Ocean below, Greenland above, the sailing route below it, the sailing route above it, Brittany (dot, right), and Newfoundland (dot, left). When these carvings are counted in this order, they represent the first six dynasties of Egypt. Brittany symbolizes the Fifth Dynasty, and Newfoundland represents the Sixth Dynasty (c.2370-2189 BC). The petroglyph shows, that the Comet Catastrophe ended the Fifth Dynasty, and that it happened at the start of the Sixth Dynasty (c.2370 BC). 2.Website: HOW THE SUN GOD REACHED AMERICA C2500 BC, Jonge, R.M. de, and Wakefield, J.S.